Located around 400 km from Delhi, Hanumangarh is a city best known for its temples and its historical significance given that it was once part of the Indus Valley Civilization. Recent excavations in the area have revealed some stunning artefacts belonging to an era of great significance to human history. The city is also known to be an agricultural marketplace where cotton and wool are woven on handlooms and sold. The primary tourist attraction of Hanumangarh is the Bhatner fort, a beautiful structure whose history dates back thousands of years. Formerly the kingdom of Bhati kings, Hanumangarh was originally called Bhatner. However, when Raja Suraj Singh of Bikaner captured the city he rechristened it ‘Hanumangarh’. The reason being that the city was won on a Tuesday, a day considered auspicious to the Hindu god Hanuman. 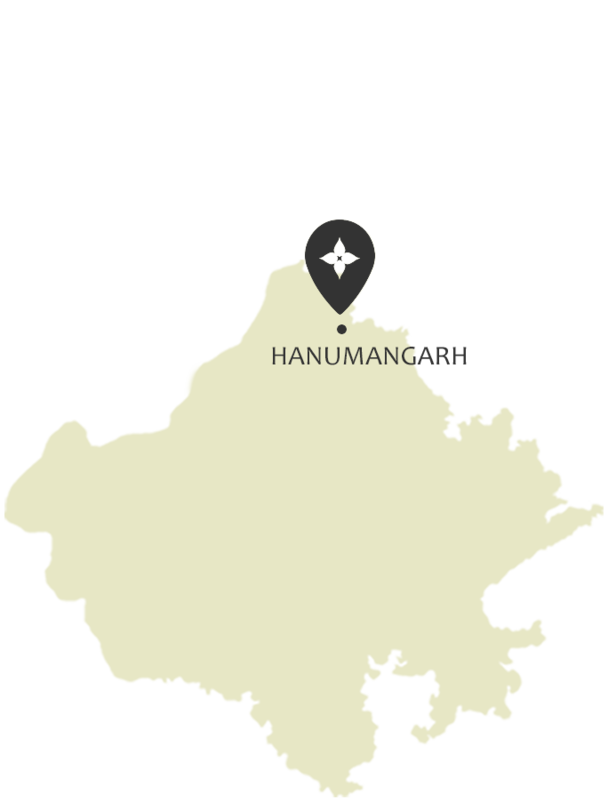 The Hanumangarh area is steeped in history and is believed to have once been part of the Indus Valley Civilization. This region was also important due to its location on Delhi-Multan highway as traders from Central Asia, Sindh and Kabul used to travel to Delhi and Agra via Bhatner. Several artefacts, coins and even entire buildings belonging to the era have been found upon excavation in the area. Come explore the wonders and sites that Hanumangarh has to offer you. There’s always something to see in Rajasthan. Considered to be one of the oldest forts in India, the Bhatner Fort or Hanumangarh Fort is located on the banks of the river Ghaggar. The importance of the fort can be gauged from the fact that Empror Akbar mentioned it in Ain-e-Akbari. The fort was built around 1700 years ago by Bhupat, the son of Jaisalmer’s King Bhatti and has withstood the ravages of time and war extremely well. Many a fearsome ruler including Timur and Prithviraj Chauhan tried to capture the fort, but such was its strength that for centuries no one succeeded at getting their hands on it. Finally, in the year 1805, Raja Surat Singh of Bikaner vanquished the Bhattis and captured the fort. The fort is heavily fortified and has many stunning gates, it also houses temples dedicated to Lord Shiva and Lord Hanuman. At around 120 km from the city of Hanumangarh, lies the Temple of Shri Gogaji. Legend has it that Gogaji was a warrior who possessed spiritual powers and he is also referred to as the ‘God of Snakes’. The temple was built in his honour almost 900 years ago by Bikaner’s Maharaja Shri Ganga Singh and stands on an elevated mount. What’s particularly interesting about the temple is its mix of Muslim and Hindu styles of architecture. The temple is marked with stunning engravings and houses a beautiful statue of Gogaji on horseback, with a lance in his hand and a snake around his neck. People of all faiths visit the temple especially during the Gogamedi festival. Gogamedi, a village located in Hanumangarh bears religious importance. The Gogamedi Fair, held during the Gogamedi Festival in memory of Shri Gogaji attracts locals and tourists alike. The panoramic view of Gogamedi is truly stunning and awe-inspiring, and makes for a great spot for photography. Located at a distance of 7 kms from Hanumangarh, the temple of Mata Bhadrakali is on the banks of the Ghaggar River. The deity the temple is dedicated to one of the many avatars of Goddess Durga. Constructed by the sixth king of Bikaner Maharaja Ram Singh, the temple houses an idol made entirely out of red stone. The temple is open to the public throughout the week. Be a part of the festivities and traditions that Hanumangarh has to offer. It’s always a celebration in Rajasthan. Engage in the many activities, tours and adventures that await you in Hanumangarh. There’s always something to do in Rajasthan. Badopal Lake is a fresh water lake located in the Pilibanga Tehsil of the Hanumangarh district. A lot of tourists flock here for two reasons – a spectacular sunrise and sunset, and because it’s a bird watcher’s paradise. You can spot flamingos, northern shovelers, black winged stilts, plovers, pied avocet and coots, among a variety of birds. At 312 kilometres, Chandigarh is the nearest airport to Hanumangarh with daily flights from Mumbai, Delhi and other major metros around the country. One can travel to Hanumangarh via road from Jaipur, Delhi, Ludhiana, Chandigarh and Jodhpur by hopping aboard a private bus or the ones run by the Rajasthan State Road Transport Corporation. Hanumangarh’s is well connected to Jalore, Agra, Delhi, Jaipur and Guwahati with a number of trains halting at the Hanumangarh Railway Station throughout the week.